For some reason vegetable side dishes are something that I struggle with when it comes to meal planning. I get stuck in a rut and always end up making the same two things (roasted broccoli/brussels sprouts or salad). I definitely think that eating the same veggies over and over again trumps not eating any veggies at all, but variety is better. I always forget about green beans, or avoid buying them because they come in a huge package at Costco (what doesn't come in a huge package at Costco though, right?) and I'm worried about eating them all before they get slimy. Gently cooking them makes them easier to use and you can freeze them if you aren't going to eat them all in a few days. There's nothing complicated here. Just some simply cooked green beans. The beauty of this recipe is that you can have tasty green veggies on hand at all times and jazz them up later. I like to reheat them in a hot pan with some coconut oil, garlic, and salt. I cook them just long enough to get a little brown around the edges. Fill a large pot with water and add salt. Heat over high heat until boiling. 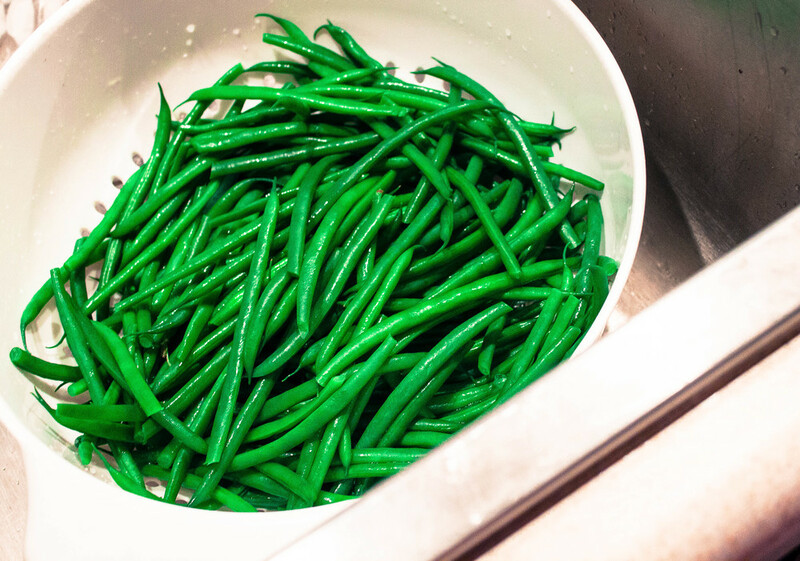 Cook green beans in batches. Cook for about 2 minutes. Once beans are cooked, place them immediately in the bowl of ice water to stop the cooking process. Continue until all the beans have been cooked and cooled. Drain and dry the beans and store in the fridge or freezer until ready to use.